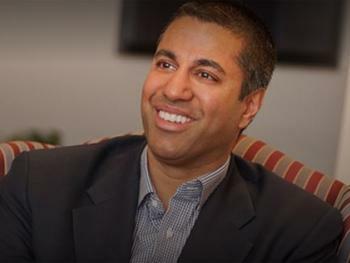 As expected, President Trump has named Ajit Pai chairman of the Federal Communications Commission, spreading joy throughout the advertising and telecommunications worlds. The Association of National Advertisers greeted the expected announcement jubilantly, anticipating a quick end to the privacy and net neutrality rules pushed through by Pai's predecessor. In an unusually blunt statement, the organization gave Pai his marching orders. "ANA anticipates Pai will likely respond positively to its request – made alongside ISP’s and other industry groups – for a full reconsideration of the sweeping privacy rules imposed on ISP’s under former Chairman Tom Wheeler," said the ANA in a news release. "And as Pai now leads a Republican majority of the FCC, he will also likely reexamine the expansion of the Commission’s regulatory authority under net neutrality rules." Pai's appointment came at about the same time as the Federal Trade Commission's release of a staff report warning of the privacy risks presented by cross-device tracking of consumers. The FTC report recommends that, at the very least, companies that engage in cross-device tracking have an obligation to tell consumers they're doing it and to offer them a chance to opt out. Those who track such sensitive data as health and financial information should be required to seek permission in advance, the report recommends. Pai, a Republican, was nominated to the FCC by President Obama in 2011. (By law, only three of the five commissioners may be members of the same party). A Harvard Law graduate, he is the son of immigrants from India and grew up in Parsons, Kansas. He has been a critic of many of Wheeler's initiatives, particularly net neutrality. The FCC in March 2015 adopted rules that treat broadband service as a utility and require internet service providers to treat all traffic equally. In a speech in December 2016, Pai said the rule's "days are numbered," arguing that the net neutrality rules were adopted without any evidence that they were needed. "There was no evidence of systemic failure in the Internet marketplace. As I said at the time, 'One could read the entire document . . . without finding anything more than hypothesized harms.' Or, in other words, public-utility regulation was a solution that wouldn’t work for a problem that didn’t exist." In October 2016, the FCC adopted new rules protecting consumer privacy on the internet. The rules give broadband customers tools to make informed choices about how their personal information is used and shared by internet service providers. "It's the consumers' information," said then-FCC Chairman Wheeler when the proposal was unveiled, "and the consumer should have the right to determine how it's used." Industry groups fought the proposal bitterly. USTelecom called it a "naked power grab." On Jan. 3, the group filed a petition asking the FCC to modify the rules, "to reflect cost-benefit consideration" and avoid conflict with existing FTC privacy rules. In a speech to the FCC staff today, Pai said that "bringing broadband to all Americans" would be his top priority. "There is a digital divide in this country—between those who can use cutting-edge communications services and those who do not," he said. "I believe one of our core priorities going forward should be to close that divide—to do what’s necessary to help the private sector build networks, send signals, and distribute information to American consumers, regardless of race, gender, religion, sexual orientation, or anything else." Yesterday was Net Neutrality Day. Did you notice?